Intelligent, adventurous, very caring and loving, loyal, however, he is also our clown and best retriever. He is the one that made us fall in love with Poodles. He has the best temperament ever; sad to say he did not clear our High Standards for breeding. He does qualify for canine training of our puppy litters and makes a wonderful ‘uncle’. He is our inspiration! He is our joy! 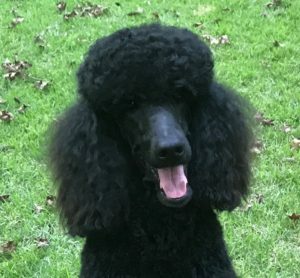 Most of all he is our Therapy Poodle. 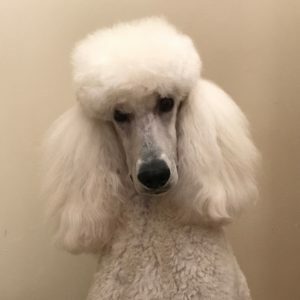 Intelligent, elegant, mischievous, loving, loyal, just a few descriptive words that cannot begin to explain this wonderful Poodle. No matter where we go he turns heads. He makes people, especially men who thought they did not like Poodles, fall in love with this wonderful breed. He is very athletic and loves to play soccer, of course his way. He loves to tease and try and change the rules of a game we are playing. He can run like the wind, and loves to do so. He is very loyal to his family (pack) and very little passes his astute attention. He is a great assessor of situations and knows how to handle most. He is indeed our pride and joy. 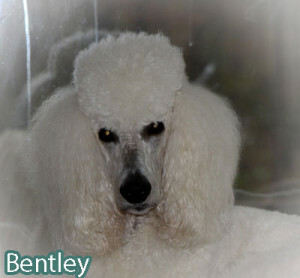 Read more on Bentley. A beautiful, gentle, elegant boy. He is loyal, sweet, athletic and a joy to all. He knows no stranger and loves to be involved with whatever activity is going on. He is smart and eager to please. He is always ready to learn a new feat. Nothing intimidates this boy. We cannot say enough about this very handsome boy. At nine weeks we could see that he could follow after his Grandfather and Uncle and be the next BIS boy. 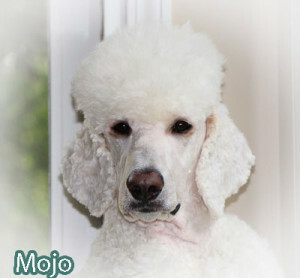 Beauty, Elegance, Grace and to top it off a Temperament that brings Poodle Mojo much pride.